In 1796 Ebenezer Zane won a commission from Congress to construct a new route to the west. This trace or path followed earlier animal and Native American foot-paths, winding its way from Wheeling, Virginia (now West Virginia) to Limestone, Kentucky (now Maysville). 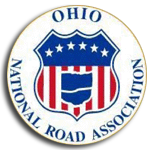 In 1803, the new Ohio legislature provided funds to widen and upgrade the road. Many towns that later prospered as a result of their location along the National Road, owe their origins to Zane’s Trace. Zane’s Trace seems to follow the long access of ridge tops as high ground was more defensible and better drained. Surviving historical accounts of the Trace portray it as little more than a blazed trail, capable of guiding a train of pack animals but a formidable challenge for a wagon. In many places the National Road followed, paralleled or crossed the earlier road. Surviving segments have been identified in Belmont, Guernsey and Muskingum Counties. “1823. First American Macadam Road” Carl Rakeman, 1926. 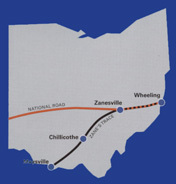 The approximately 70 miles of the National Road from Bridgeport to Zanesville was the first Federal road in America constructed using the macadam technique, three compacted layers of stone laid in a trough cut slightly below grade, creating a relatively smooth, durable surface capable of shedding water.